"[This book] gives us strategies for bringing life back to school; it allows us to think creatively about connecting instruction to the lives of children who have not been well-served; it helps us learn to value the gifts with words our children of color bring; and it gives us hope for educating a generation that can change the status quo, that will build the America we have yet to see…the one that made that as-yet-unfulfilled promise of ‘liberty and justice for all.’"
Toward a Literacy of Promise examines popular assumptions about literacy and challenges readers to question how it has been used historically both to empower and to oppress. The authors offer an alternative view of literacy – a "literacy of promise" – that charts an emancipatory agenda for literacy instructional practices in schools. Weaving together critical perspectives on pedagogy, language, literature, and popular texts, each chapter provides an in-depth discussion that illuminates how a literacy of promise can be realized in school and classrooms. 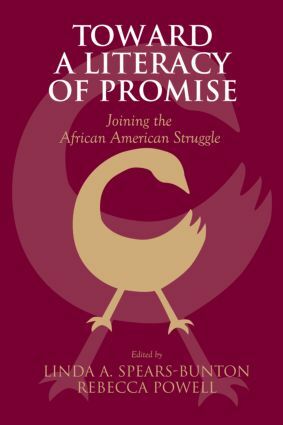 Although the major focus is on African American middle and secondary students as a population that has experienced the consequences of inequality, the chapters demonstrate general and specific applications to other populations. Linda A. Spears-Bunton is Associate Professor of English Education and an affiliated faculty member in African New World Studies at Florida International University, Miami, Florida. Rebecca Powell currently serves as Dean of Education at Georgetown College in Georgetown, Kentucky, where she has taught since 1993. She holds the Marjorie Bauer Stafford Endowed Professorship and was awarded the Cawthorne Excellence in Teaching Award in 2003.